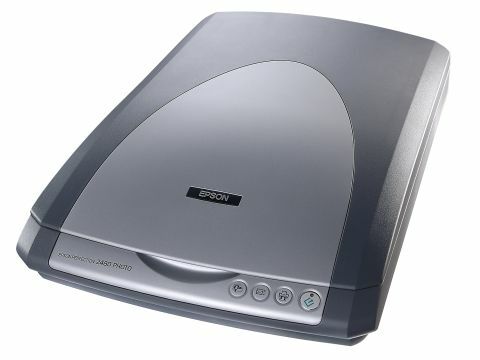 There's a lot of scanner in this small and unassuming grey box from Epson. For starters, you get a competent scanner with 2,400 x 4,800dpi resolution and a film adapter for scanning slides and negatives. A USB 2.0 Hi-Speed interface makes for rapid scans, although you need a Mac that supports USB 2.0 (any Mac bought in the last year or two). You can also fit a USB 2.0 PCI card to older PowerMacs that are running Jaguar. Without the higher-speed port, your scans will take up to three times longer to do. Unlike more expensive models, the 2480's film adapter can only handle three 35mm frames of film at a time. If you have a lot of frames to scan then it may be a chore. However, most people only want to scan in a frame or two at a time, so for beginners this is not an issue. Like all Epson scanning software, the TWAIN driver has built-in colour restoration and a dust and scratch removal function. The dust removal is software driven; there are no fancy infrared sensors. It's rough and ready but you do get a reduction in the debris that most frames of film harbour. You also get some softening, but if used with care it's fine. The colour restoration feature is superb - great for revitalising old colour images from the 70s. Scanning time is acceptable at around 20 seconds for an A4 page at 300dpi. Colours tended to be a bit overblown and saturated compared to pricey pre-press models. That said, this is a scanner that you'd expect to produce more consumer scans, where the preference is for bright and bold colours.